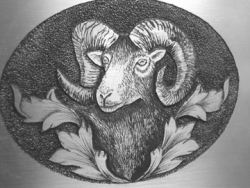 We will walk you through the steps of using the high-speed engraver on metal. You will learn various techniques of surface etching and also deep carving a mountain ram with a leaf script design onto the metal. You will be taught the secrets of transferring detailed designs, similar to scrimshaw, onto metal. You will also learn how to relief carve into the metal. It is amazing to watch the depth that can be achieved on a thin, sterling silver belt buckle! In addition to the engraving techniques, you will learn how to darken your design.